Lifesaving blood and plasma from Seattle will help stabilize patients during transport. Nurse Kay Selby at the Juneau base with cooler of blood products. Airlift Northwest, the first medical air-transport provider in Southeast Alaska, this month began carrying two units of packed red blood cells and two units of plasma on its aircraft based in Juneau. Those flights are now better equipped to stabilize patients in urgent need of blood or plasma during transport from remote areas to a hospital. Juneau joins Airlift Northwest's other bases in having blood products on departing flights. The ability to transfuse these products during transport will help save lives and improve patient outcomes, said Dr. Richard Utarnachitt, Airlift Northwest's medical director. “Within 36 hours of implementing our new program, we helped stabilize a patient by providing a unit of plasma,” he said. Bloodworks Northwest, which collects and distributes blood products to Pacific Northwest hospitals, is the source of the red blood cells and plasma in this program, which come through Harborview Medical Center's Transfusion Services. 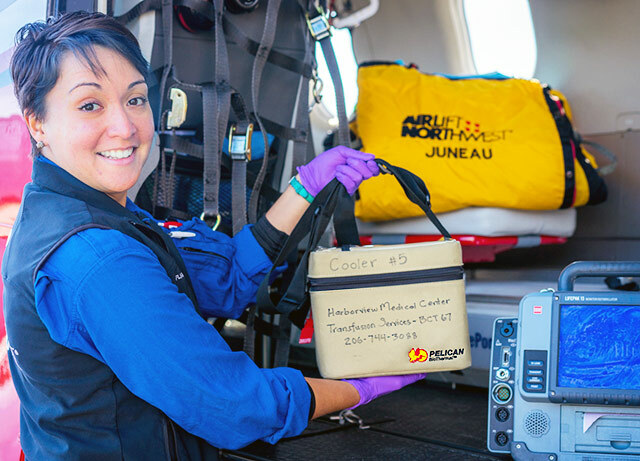 "We are honored to partner with Airlift Northwest, UW Medicine and Harborview Medical Center to meet the transfusion needs of people in Southeast Alaska receiving trauma care,” said Dr. Rebecca Haley, Bloodworks’ medical director for blood services.